As with most training resources, this is written in the hope that trainers will start at page 1 and work their way systematically through the information and exercises till the very last full stop. But, since we’re realists, we also know that some trainers won’t have the time to do this! (For example, because you’ve got a few million other tasks in order to run your ward.) And you’ll be very aware which of your staff need extra help in which aspects of effectively talking with patients so will no doubt choose features and exercises accordingly. The exercises are intended to be useful whether staff are working on these by themselves, in pairs or small groups, or in a more formalised training session. The exercises are ‘addressed’ to your staff directly rather than to you as the trainer, so that you can simply photocopy and use them. Ward Buddy is here to accompany inpatients through various experiences of ward life; from arriving on the ward to the rediscovery of hope, amongst other themes. 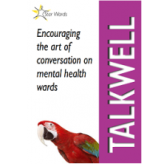 The booklet is filled with experiences of recovery and mini snippets of ward life that have been kindly offered and beautifully illustrated by people who have had stays on mental health wards. Many, many staff and patients have met, played with, tickled the tummy of and generally messed around with the real-life Buddy, Marion’s loyal companion, faithful support dog and advisor on four-legged issues. Although this booklet is by no means a replacement for the real thing, it is hugely inspired by the companionship and comfort pets bring. Include it in patient welcome packs! Ward Buddy provides a gentle and useful introduction to ward life, with a strong peer support approach. As a journal or diary. Expressive writing can have a significant therapeutic effect on our mental and emotional health. You might encourage patients to use Ward Buddy as a journal. Users can jot down their thoughts and feelings, as well as their recovery-focused plans and goals. Throughout the booklet there are boxes which can be written in (or drawn in, if preferred). The short recovery stories and mini ward life snippets on each page are intended to inspire and motivate. For example, after reading one of these, patients may want to write down some of their own reflections on its theme. They could do this in the form of creative work like poems or drawings in facilitated sessions or on their own. They may even want to try out some of things the stories and snippets describe, or tell someone else about them. As a note pad. Yes, Ward Buddy can also act as a trusty, simple note pad. Patients can scribble down phone numbers, appointment dates, any important information and ideas they have while on the ward. As a way to plan and remember what to speak about with staff. Ward Buddy can help prepare and prompt your patients to share the things that matter to them with nursing staff and their doctor as well as other key people. As conversation starters. The little snippets of ward life throughout this booklet are great conversation starters and topics to chat about with others, including in ward activities. Use it alongside recovery plans. 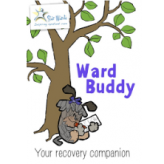 If your ward provides a recovery tool (for example, Wellness Recovery Action Plan or the Recovery Star) your patients might like to use Ward Buddy as inspiration. You could print it and bring it along to recovery planning sessions. Simply read it. There’s absolutely no pressure to write or do anything; patients may just want to read through Ward Buddy’s pages in their own time. We’re sure this lovely little printable booklet will complement the amazing care you give on the ward. We really hope you find lots of uses for Ward Buddy and it becomes a helpful and therapeutic resource.